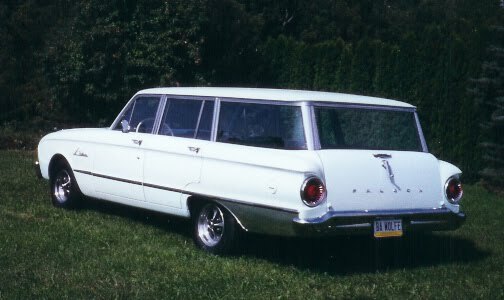 After it's purchase in 1995 this 1962 Falcon Station Wagon was used as an extra car for about 3 years. When purchased, the engine was seized and then replaced with a 1967 Two Hundred Cubic Inch Six Cylinder. The paint was very thin and after 3 years outside it needed a paint job. The car was stripped down to bare metal and then placed on a rotisserie. This made the restoration much easier. There are 3 non-stock items on this Falcon. The generator has been replaced with an alternator. The engine is a 200 six, not a 170 six. The stock wheels and hub caps were replaced with the Keystone Mags. That's it, the rest of this Falcon is stock. Check out the next pictures below for the final results of the restoration. The rest of the pictures are before and then during the restoration process. It was made from several FCA National T-Shirts and made with a lot of "LOVE". 2001 @ the FCA National in Cromwell, CN Won first place in the Station Wagon Class. was painted the same color as the exterior. Lined up with a 1957 T-Bird and a 1968 Falcon Futura (Bonnie Blue). Three pictures below from Thanksgiving 2003 @ Levitz Park near Grantville, PA. Check out the next 2 pictures. Note the CD player hanging under the dash. This CD player is attached to an extra ash tray. A strap bracket is also attached to the back of the stock radio and then with a wing nut to the CD player. This makes it easy to install and remove. Just unplug the connections and twist off the wing nut on the strap bracket supporting the back of the CD player. Pivot the strap bracket up, hide the wires and slide in the stock ash tray. Now everything looks stock. Here are a few pictures of the wagon before the restoration. The 200 six was locked up solid. There was no way to get it turned over. When the clutch was engaged when towed down the road the back tires would slide. A 200 six from a 1967 Falcon was installed. As you can see, it was a very solid car with no rust. Below are a few pictures of the brake job in 2011.